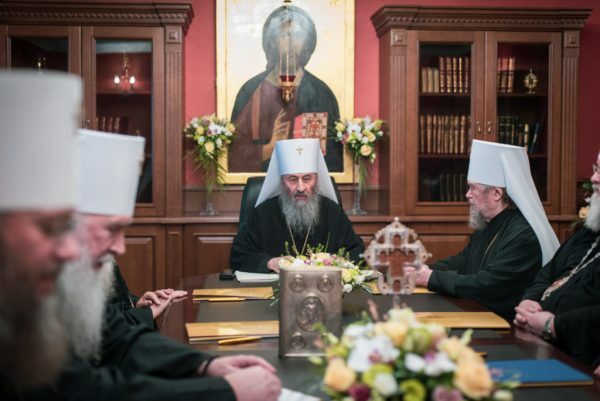 On December 7, 2018, the Holy Synod of the Ukrainian Orthodox Church, which met at the Kiev-Pechersky Lavra of the Dormition under the chairmanship of His Beatitude Metropolitan Onufry of Kiev and All Ukraine, discussed the interference of state authorities in church life in Ukraine and the convocation of the so-called uniting council. The other day, Ukrainian President P. A. Poroshenko announced the convocation of a ‘uniting council’ to take place on December 15 in Kiev. The bishops of the Ukrainian Orthodox Church are receiving invitations to attend it, signed by Patriarch Bartholomew of Constantinople. These invitations are handed over to archpastors through representatives of the Ukrainian State. As the Synod members noted, despite the repeated appeals of the Ukrainian Orthodox Church, the state authorities in the country continue to interfere rudely in church life. In its adopted decision, the Synod states in particular that, on the basis of the Ukrainian Orthodox Church Bishops’ Council Resolution of November 13, 2018, the Ukrainian Orthodox Church, just as other Local Orthodox Churches, does not recognise the Patriarch of Constantinople decisions of October 11, 2018, in particular, the one on the extending of the Patriarchate of Constantinople’s jurisdiction to the territory of Ukraine and lifting of anathemas on the leaders of church schisms in Ukraine and renewal of their episcopal and priestly ranks. ‘The Patriarchate of Constantinople has no canonical right whatsoever to convoke any gathering in Ukraine and to summon bishops of the Ukrainian Orthodox Church to it’, the participants in the session stressed. The Synod resolved that the planned ‘uniting council’ be considered unlawful since it will be attended by representatives of schismatic groups. Therefore, the episcopate, clergy, monastics and laity of the canonical Ukrainian Orthodox Church are not authorized to participate in the so-call uniting council. Having expressed concern over numerous cases of pressure put on hierarchs of the canonical Church with the aim to make them attend the so-called uniting council – which is a direct encouragement for them to violate the episcopal oath to be observed even under the threat of death – the Synod pointed out that ‘the Ukrainian Orthodox Church does not empower any member of the episcopate, clergy, monastic communities and laity to represent it at the so-called uniting council’. In accordance with the Statute of Governance of the Ukrainian Orthodox Church, a Council of the Ukrainian Orthodox Church shall be convened by its Primate, who is His Beatitude Metropolitan Onufry of Kiev and All Ukraine. The Synod members also stressed that as of today, there has been no decision made on the convocation of a Council of the Ukrainian Orthodox Church. ‘The Ukrainian Orthodox Church will consider any decision made by the so-called uniting council invalid and having no legal or canonical force whatsoever’, the Synod states.